Members of the Whitefish Community Foundation board and City Council gathered last week at interim City Hall. Center, Mayor John Muhlfeld presents foundation President Linda Engh-Grady with the city’s Extra Mile award. Muhlfeld proclaimed Nov. 1 as Extra Mile day in honor of the community foundation. 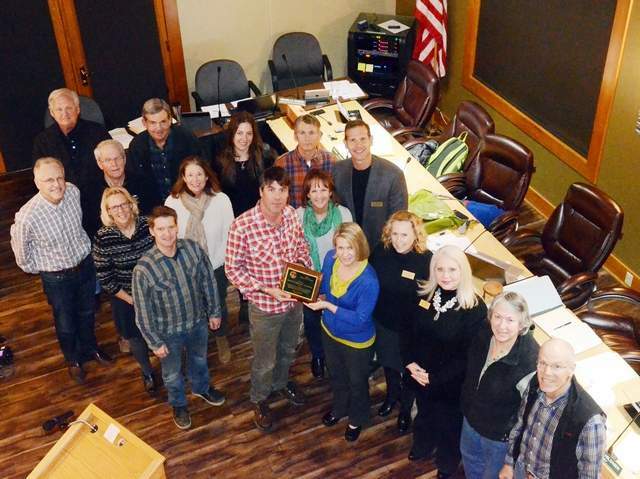 Muhlfeld and City Council members last week presented the award to foundation President Linda Engh-Grady and the community foundation board members. Founded in 2000, the foundation has supported local nonprofit organizations serving Whitefish with more than $20 million in grant funding. Muhlfeld noted that those nonprofits have worked in supporting the hungry, assisting and lifting the undeserved, building affordable housing, caring for the sick and impoverished, supporting programs to protect and enhance the natural environment, and enriching the community through the arts. He recognized the efforts of Engh-Grady, who has overseen the foundation since 2008 and has led efforts to grow the community grant programs to award over $500,000 annually with assets now exceeding $12 million. Muhlfeld also gave a thank you to the individuals, organizations and businesses that donated to the 2016 Great Fish Community Challenge, which resulted in contributions totaling close to $1.2 million. As a result, the foundation distributed nearly $1.5 million to 40 participating nonprofits in the second annual challenge. “You lift our community and make it a place we are all proud to call home,” he said.